The first volume of the new Redman comic book series by Matt Frank and Goncalo Lopez is set to release worldwide on May 30th, 2018. Announced late 2017, the first volume of the new comic book series Redman, titled Redman Volume 1: Kaiju Hunter, will be released worldwide on May 30th, 2018 through Amazon Japan. The book will contain 120 pages which covers episodes/chapters 1 through 5 plus exclusive making-of material. The comic will be in both English and Japanese and cost 2500 yen plus tax. A U.S. release date has yet to be announced. Story and art will be done by Matt Frank with colors by Goncalo Lopez. Redman will be released by Phase Six and distributed by Knight Shining Inc.. He is Redman, the Kaiju Hunter… Trapped in a desolate and yet somehow familiar world populated with an vast array of the ferocious beasts known as “Kaiju,” Redman continues his endless Red Fight, battling tirelessly to cull the monsters. 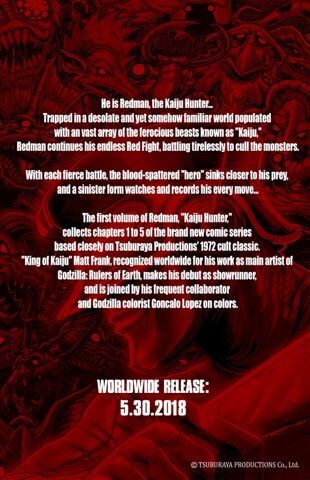 The first volume of Redman, “Kaiju Hunter,” collects chapters 1 to 5 of the brand new comic series based closely on Tsuburaya Productions’ 1972 cult classic. “King of Kaiju” Matt Frank, recognized worldwide for his work as main artist of Godzilla: Rulers of Earth, makes his debut as showrunner, and is joined by his frequent collaborator and Godzilla colorist Goncalo Lopez on colors.